Like the dashboard on your car, your business system should be designed to provide the essential information that warehouse managers must have in order to know exactly how their operation is performing. But many systems are "data rich, information poor," also known as DRIP. Because so much information is available on contemporary warehouse management systems, some managers cannot resist the temptation to put far more metrics in a warehouse dashboard then you will find in the dashboard on your car. The result is predictable — when the manager has too much data, it is difficult or impossible to convert this into actionable information. As a motorist, consider the critical things you need to know when you look at your car's dashboard. If you have a lead foot, the speedometer is the most critical indicator, since it tells you how fast you can travel without the risk of arrest. Second in criticality is the fuel gauge, since it will prevent you from running out of gas. The odometer tells you (and the next buyer) how far the car has been driven, and it also shows when the vehicle is due for oil change and other services. Some indicators are obsolete relics from an earlier age. Temperature indicators are seldom needed today, since engine overheating is rare in today's automobiles. Oil pressure indicators are seldom needed, since modern engines rarely experience pressure abnormality. Some manufacturers group these obsolescent references in a warning light labeled "check engine." While the motorist is told that something is wrong, only a car dealer can identify the specific problem. Another indicator that is meaningless to the average driver is the RPM (revolutions per minute) indicator. All of this demonstrates that automotive engineers, like software gurus, are often guilty of providing data that the average operator neither needs nor wants. Unfortunately, distracting data indicators are more common in WMS software than in automotive dashboards. As the variety of available data continues to grow with improved technology, system designers cannot resist the temptation to publish data that warehouse operators do not really need. As a result, the dashboard becomes increasingly distracting, and therefore difficult to read or understand. We enter the land of DRIP. Every dashboard needs a dial to reflect volume, just as every car needs a fuel gauge. The simplest way to do this is to show total number of units handled, and usually that is the total number received plus the total number shipped. While some managers may need a breakout, the only information that every manager needs is the total number of pieces moving through the warehouse. One dashboard I've seen itemized three different types of receiving, plus three more varieties of shipping — a perfect example of DRIP. Warehouse managers are better served by having a single volume number on the dashboard, with further detail available only if and when the manager actually needs it. The dashboard should also measure productivity, and the simplest way to do this is to track units per hour (UPH). In most operations, productivity will vary depending on the type of work being done. Shipping may be slower than receiving, or vice versa. When processing is involved, UPH productivity will be affected. However, over time these differences will tend to balance out. A common mistake is to create a dashboard that reflects productivity with receiving, picking, staging, bulk and other different types of work — again overwhelming the manager with more data than is really needed. When the productivity number moves in a surprising way, that is the only time to get into further detail. The best measure of receiving effectiveness is called "dock to stock" time, usually measured in hours. That is the time elapsed between the moment when in an inbound load is completely finished and the time when that product is available for shipment. In other words, it measures the processing time necessary to record the receipt and enter the merchandise into inventory records. This measure is critical because goods are sometimes sitting in a warehouse but cannot be shipped until every detail of the transaction has been processed. 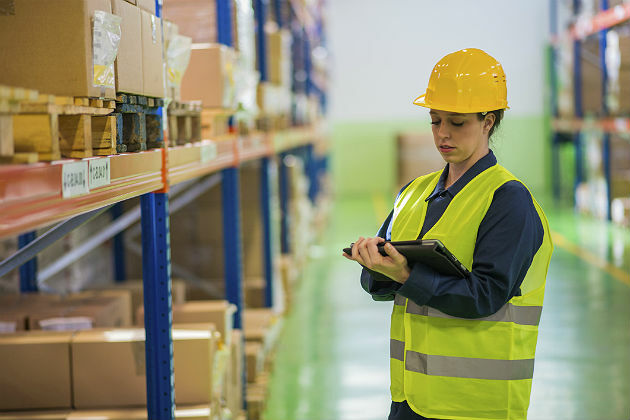 Particularly at times when inventory is scarce, an abnormally slow dock-to-stock time can do great damage to a warehouse operation. Two measures are associated with quality control: accuracy rate and percentage of on-time shipments. Accuracy rates of over 99.9 percent are frequently found today, thanks to the use of automatic identification systems like barcode scanning and voice recognition. While it is obviously important to avoid shipping errors, the consequences can be different in a closed loop distribution system. For example, a warehouse shipping to a chain of retail stores may find minimal impact if blue sweaters are shipped instead of red ones, since the retailer can probably sell the product anyway. A dashboard that includes processing accuracy and bill of lading accuracy is guilty of DRIP. The only critical measure is the accuracy that is delivered to the customer. A decent record of on-time shipments is an important quality measure. At the same time, the date of customer receipt is more important than the date of shipment, since the customer expects the warehouse operator to control transportation. In order to maintain a client receipt record, it will be necessary to trace every shipment. One metric that is missing from most dashboards, but should be included, is a record of employee retention. As the economy improves, shortages of labor will become common. Such a shortage already exists with truck drivers. Retention is simple to measure — if you had 100 employees on the first day of January and lost two of them during the month, the retention record would be 98 percent. A sudden or significant change in the retention record is a clear sign of ineffective recruiting, improper compensation or poor line supervision. One expert calculates that the cost to replace people in certain positions is as high as 2.5 times annual salary. Surprisingly, relatively few companies include employee retention in their dashboards. The graph shown below is one idea of an effective dashboard for warehouse operations. It should be supplemented by more detailed breakout figures, but these should be referenced only when the dashboard reflects surprising changes. To summarize, a warehouse operations dashboard should be no more complicated than the dashboard in your car. If you expect your operations people to be as interested in quality and productivity as you are, you would be foolish to bury them in so much data that they cannot discover the truly essential information.